Balm-Hair Mask "MILK & BAMBOO" - the restoration of dry and damaged hair ! Balm-mask helps hair to remain flexible and healthy. It creates a soft, acidic environment on the surface of hair, and neutralizes the alkaline effect of shampoo, and saturates the hair with moisturizing agents. Burdock oil and vitamin B5 (D-panthenol) make balsam mask particularly nutritious and restorative tool, ideal for normal, dry and damaged hair. The components of burdock oil penetrate the hair roots, nourish and strengthen hair follicles, thereby prevents hair loss and greatly accelerates their growth. In addition, it helps to uniformly restore hair structure, restores shine and suppleness. In turn, vitamin B5 (D-panthenol) penetrates the hair shaft and accumulated there, contributing to the conservation of moisture inside the hair. With this diameter of the hair shaft is increased, reducing the possibility of further damage. Balm-mask eliminates static stress, protects the hair from mechanical damage and adverse environmental impact. Balm-mask conditions the hair along its entire length, making them soft and manageable, so there are no problems with combing and styling. After applying the balm mask your hair will be perfectly smooth and silky, get additional power and energy. How to use: Balm - Use a mask after shampooing shampoo "Milk & Bamboo. Apply the balm through the hair and let sit for 1 to 2 minutes, then rinse with water.To better nutrition and exposure to intense 1-2 times per week balm mask applied for 5-10 minutes. D-panthenol - envelops each hair with a thin protective film, keeping moisture from the inside without weighting effect. Thus, protects hair from harmful UV rays and heat. Burdock oil - penetrates the hair roots, nourishes and strengthens hair follicles, thereby occurs to prevent hair loss and significantly accelerated their growth.In addition, it helps to uniformly restore hair structure, restores shine and elasticity. Result: After applying the balm hair mask will be perfectly smooth and silky, get extra strength and energy. Whey - a natural product of nature, which gives us health and beauty. It is a complex mixture which includes lactose, proteins, probiotic bacteria, proteins, enzymes, lipids, lactic acid, vitamin B complex, A, E, C, PP, p-carotene, polysaccharides, amino acids, minerals (potassium, magnesium, calcium, phosphorus). The information contained in whey lactose is used in the field of dermatology as a conditioning agent, it gives the hair elasticity and healthy look and soft feel. In the process of fermentation, about 7.5% of lactose is transformed into a natural lactic acid, which in turn has an exfoliating, moisturizing and anti-microbial effects, promotes hair on a roll. A valuable quality of lactic acid is that it acts on the keratinous epidermal areas, without damaging them. 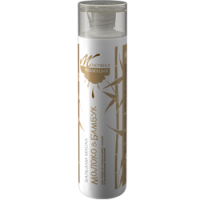 Bamboo extract - returns the strength and elasticity of the hair, perfectly moisturizes and tones the scalp, restores the structure of damaged hair after dyeing. WALNUT EXTRACT - has high regenerate properties, stimulating the recovery and growth of hair. Able to protect the hair from atmospheric pollution and the sun's rays by blocking the action of free radicals. EXTRACT nutmeg - excellent tones the scalp, soothes, anti-inflammatory effect, nourishes the hair follicles, strengthens the roots, preventing hair loss.. Shelf life: 18 months. Store in a cool place, avoid direct sunlight, protect from freezing.